What do you think about what the Governor has proposed so far? Anything surprise you? Anything you're really happy or upset about? I feel sort of sorry for him. He is handcuffed by a recalcitrant legislature. I don't know if Missourians pay attention enough to mount offer up much populist support for most of these proposals. We're now airing House Speaker Tim Jones' GOP response to the Governor's speech. Jones mentions infrastructure, Nixon did not in his address. Tim Jones, education reformer extraordinaire. Jones calls effort to expand Medicaid a "ploy" by Washington to "force the hand" of states like Missouri. 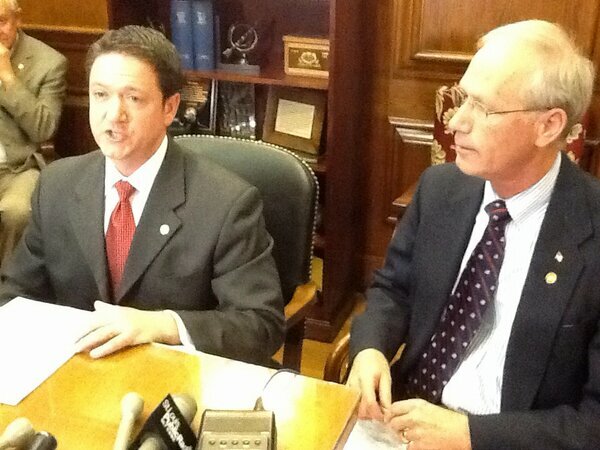 Jones: "One of our top priorities will be to reform our medical malpractice system." Well - the Governor has concluded his remarks. Your initial reactions to what was said? Both the Governor and Speaker Jones have addressed the state tonight. There's lots to digest. Your initial thoughts? If only we were educated enough to elect better legislators, sigh. Wasn't able to watch the address live. Interested to hear comments on Medicaid expansion. As you've let the address and response settle in your mind a little bit - what stood out?